If you’ve had some success, these are critical questions to answer. The professional services business can be a great place to create profits—done right, the margins are huge—but if you’re not “billing” you’re not making money. Paul Chase–one of our Unstoppable CEO Elite members has found one way to take some profits off the table, and put them to work for you, without a lot of complication. 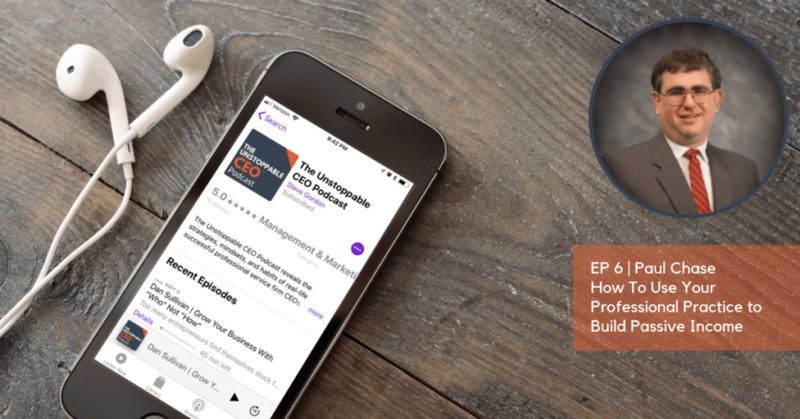 In this episode of The Unstoppable CEO Podcast, I interview Paul about his unique (and very accessible) method for creating consistent passive income with the profits from his main real estate practice. 00:12 Steve introduces Paul Chase. 01:36 Paul tells us how he turned around his business model from a realtor to a private money lender and what exactly is a private money lender. 02:29 In private money lending there are a lot of rules and regulations that have to be navigated. Paul talks us through how he managed this. 05:26 Paul credits Steve’s book (The Unstoppable CEO) in teaching him to get to know preferential potential clients – Entrepreneurs. 08:02 Paul didn’t lump himself all the work. He tells us how and why he called in the experts to help him. 09:24 When Paul had money to invest in real estate, but didn’t want to deal with the 3 T’s (Tenants, Toilets & Trash), it was an email from a friend that lead him getting checks in the post. 11:05 Paul gives us a quick breakdown of the first couple of deals that started off his business. 17:33 Paul takes about the pressure of finding the next deal as a realtor has been replaced by the deals coming to him. 20:55 Paul tells us about the books he’s reading now and how he’s looking into AI.